Getting the first capture in a ko is important, because the opponent will then have to find the first ko threat. This is usually worth some points in a ko of substantial value when adequate threats are limited. In an almighty ko capturing first can decide the ko, when there is no adequate threat on the board, especially early in the game. 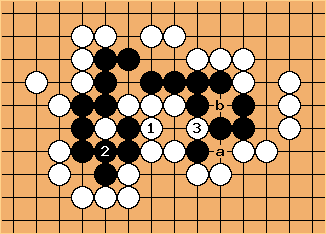 The basic technique to get the first capture is to throw-in where the ko will appear before creating it, and then create the ko with a double-purpose move that finishes setting up the ko while forcing the opponent to answer elsewhere. The throw-in ensures that the opponent already has a stone within the ko that we can capture. This is a recurring technique in many life-and-death situations in games. The example problem below illustrates this principle. At first glance, it looks like Black has two eyes. However, these eyes are a bit too close to each other ! How can White exploit this? A possible exploitation is to first atari at , forcing , and then creates a throw-in ko at . 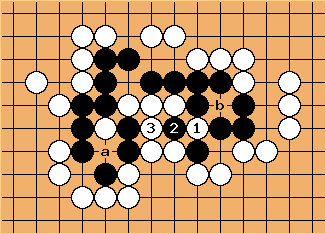 If White wins this ko, then White can capture at a, rendering the eye at b false. However, Black gets the first capture for this ko. Can White do better? The answer is yes. Instead of making the atari on the two Black stones first, White can make the throw-in at first. Then when captures, is a double atari. Now when Black plays at a to save the two stones, White gets the first capture at . Hopefully, the reader will find it useful.